Kim Jong-Un Got More from the Summit than the U.S. The problem is, the document describing the agreement between the U.S. and North Korea was pretty vague. 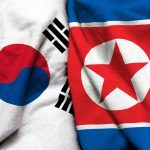 Although the document says that “The United States and the DPRK will join their efforts to build a lasting and stable peace regime on the Korean Peninsula,” it doesn’t specifically mention how that will be done. And while creating a lasting peace is a nice sentiment, the how is equally as important. When World War II ended, Japan lost control of Korea—which was then one nation—to Allied forces. Korea was then divided at the 38th parallel, with the Soviet Union administering the northern half and the United States administering the southern half. Both sides had planned for free elections in the two Koreas, but in 1948, Kim Il-sung, leader of the Communist Korean People’s Army, convinced Soviet leaders to refuse permission for UN authorities to come north of the 38th parallel. Thus, the election never happened in North Korea. In 1950, the Soviet- and China-backed North Korean army invaded South Korea. The war that followed was never officially declared by the U.S. Congress, but troops from the U.S. and other UN nations came in to aid South Korea. This brutal and bitter war went on for three years, until the Korean Armistice was signed in 1953. The armistice re-established the division of the two Koreas at the 38th parallel, with a demilitarized zone extending 2 kilometers in either direction. 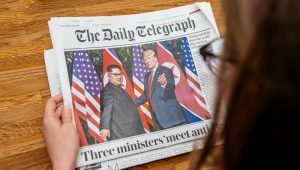 The document essentially restated promises North Korea has already made and did so in a vague way. It didn’t force any new or concrete measures to demonstrate that Kim is committed to denuclearization. Kim even won some “security assurances” he had sought with the U.S. for a long time. President Trump hailed the summit as a historic occasion, the first time an American president has met with North Korean leaders. While it certainly is true that he is the first U.S. president to meet with North Korea, he’s absolutely not the first who offered to sit down with Kim Jong-un or his father, Kim Jong-il. The difference between President Trump’s invitation to meet and those of other presidents is that previous presidents have come to the table with a firm stance on denuclearization and insistence on a timeline for that denuclearization. Of course, President Trump’s own negotiating style involves a lot of spoon-banging, too, so maybe he and Kim are the perfect match for one another. One thing is for sure, though: Kim definitely got more than President Trump at the negotiations. North Korea has now been legitimized by a visit with the president of a powerful nation, President Trump has said he wants to stop the “war games” off the Korean peninsula and bring home many of the U.S. service members currently stationed in South Korea. In return, President Trump got a simple and vague commitment of “working toward” denuclearization.